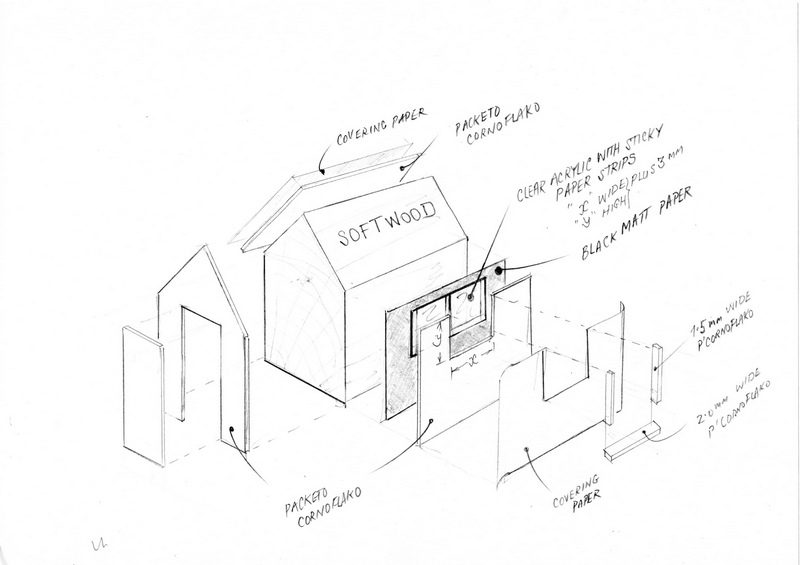 Forgive me if I post an unsolicited "OwIdidit" here, but having just watched a U.S. You Tube video nearly an hour long on the same subject for mediocre results I thought this might help someone who has to do a number of small sheds, outhouses, kennels etc and doesn't want to spend a lot of time at it. 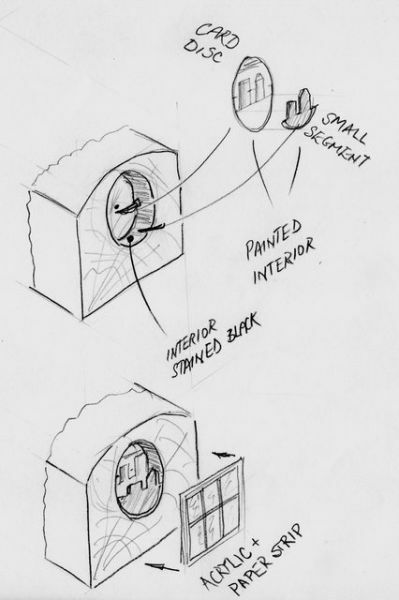 Iv'e done a drawing to show how simple it is, they stand reasonable "lookin' at", and the fact that you can't see inside doesn't detract too much from their effectiveness. The shiny acatate reflects the ambient light quite well. 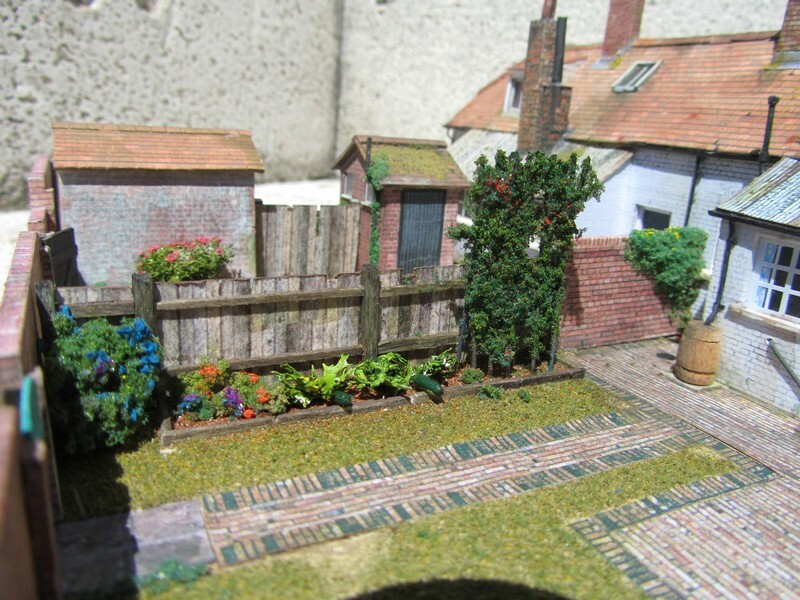 Those shown below are from a terraced cottage scene I made some years ago, but you'll get the point. Just Packeto Cornoflako and bits of scrap. 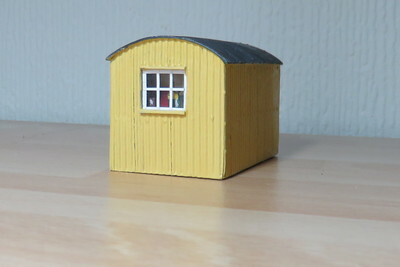 All five sheds made in less than an evenings work, as no measuring as sides and fronts etc can be cut almost straight off the blocks themselves. What are the two cages for, Doug? Out of interest the covering paper effects look very good - what brand are they? Knowing Doug, they would be from Scalescenes. Dave, Sol has got it spot-on....Scalescenes. Max, the cages are for dogs, the cottage at that end is occupied by a stockman's family. 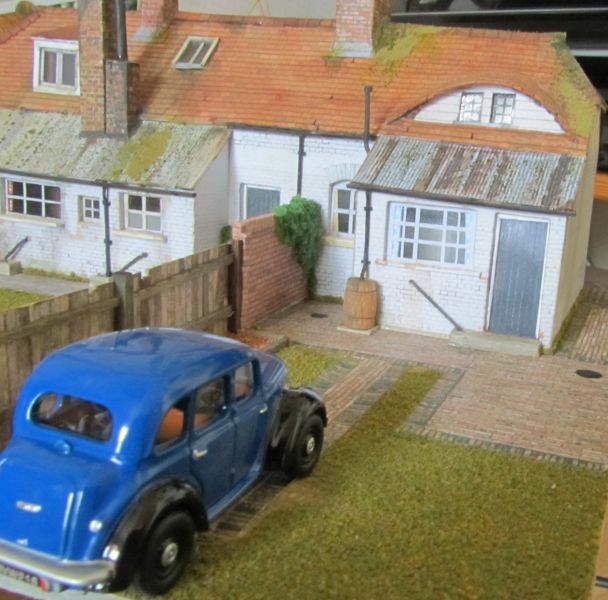 The other end is occupied by a travelling salesman, Suitcase Sam, hence the nice garden and the car, the only one at White Cottages. 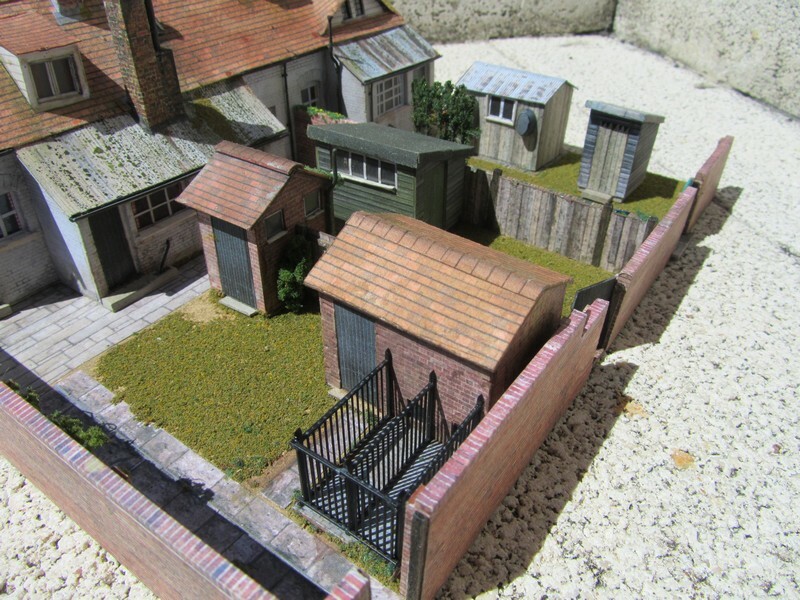 The row was scratch built from an illustration in J Ahern's Miniature Building Construction, I'm sure I've shown some pictures here? You mentioned John Ahern's book - as others have done from time to time. Every now and then I have searched for John Ahern's book but the postage to Oz keeps putting me off. One US second hand store was charging something like $8 for the book and $34 for postage. I can see the doggie doors, now I look more closely. I take it that you would have used plywood or foam core for the brick fences with similarly stuck on paper bricks? 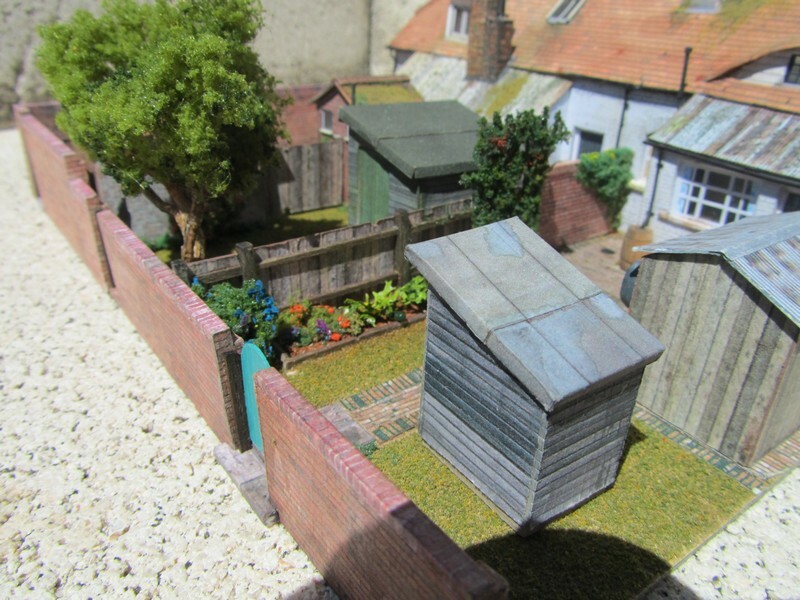 A few changes in the minor details and it could just as easily be an Australian back yard in an inner city area! 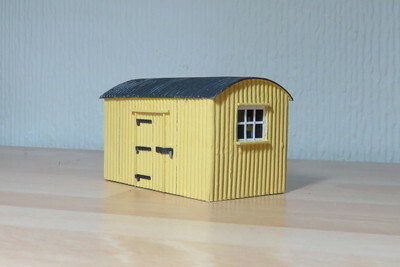 herewith, prior to being weathered etc., a corrugated lamp hut showing the use of the card. In all honesty the corrugations are a bit large, but it looks about right. A Forstner bit is used to open a void in the end of the wood which is stained black with a permenant marker then card scraps painted to represent 'summat' glued in before an acrylic and paper strip windpw is glued on underneath a layer of card. Not high class modelling, I agree, but as a rear scene filler I think it passes muster. The first bit of modelling I have done in almost a year, my, don't the fingers get out of practice! I hate to pick, Doug, as your card modelling is always such a joy, but may I ask how Suitcase Sam gets his wee car into the garden through what appears to be a single personnel gate?